There are rust stains on the cloth from the steel rods - cosmetic defect only. 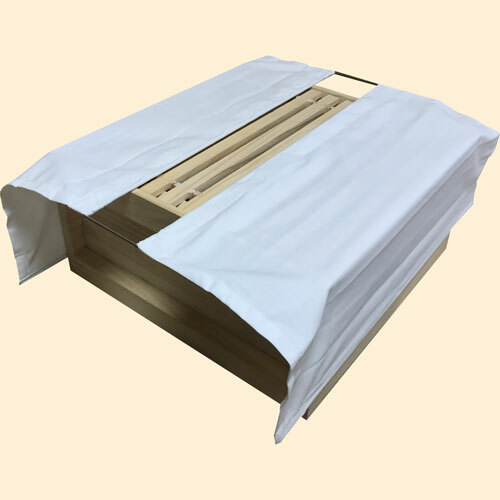 This bee hive inspection or manipulation cloth is used during inspections. It reduces the number of bees in the air, particularly useful in helping control the colony. Also, more importantly for the colony, it helps to keep heat in the hive reducing wind chill and colony stress. The centre stainless steel section is 24 inches x 4½ inches. The 2 side flaps are each 24 inches x 14 inches and are weighted with steel rods sewn in. Made from soft but strong cotton drill fabric.